Android Nougat 7.1 ROM, CM14/14.1 for Moto MAXX, Turbo and Droid Turbo (CyanogenMod 14.1). In addition to this CM14.1 ROM we also have the Lineage 14.1 for Moto MAXX (quark). For latest updates, stay tuned to the Lineage OS device list page. 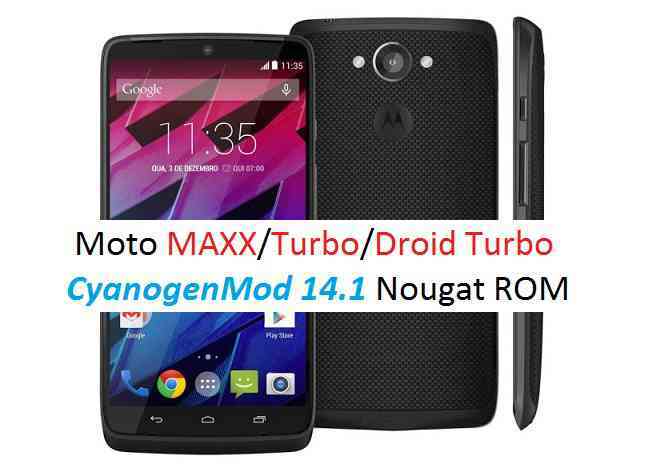 Since Google released Android Nougat Source code, we have update many Android NOUGAT AOSP ROMs and we also have updated List of Available CyanogenMod 14 ROMs and many are yet to come including this CM14/14.1 for Moto MAXX, Turbo and Droid Turbo (quark, XT1225, XT1250 and XT1254), which is brought to you by developer calsurferpunk. If you like this ROM then consider donating calsurferpunk via PayPal. THIS IS AN INITIAL BUILD. THIS MAY NOT BOOT AT ALL OR IF IT BOOTS IT MAY HAVE MANY MORE BUGS THAN YOU CAN IMAGINE AND HENCE CANNOT BE USED AS A DAILY DRIVER IN ANYWAY. TRY AT YOUR OWN RISK. Installing a custom ROM on a Moto MAXX, Turbo and Droid Turbo requires the bootloader to be unlocked on the Moto MAXX, Turbo and Droid Turbo phone, which may VOID your warranty and may delete all your data. Before proceeding further you may consider backup all data on the phone. You are the only person doing changes to your phone and I cannot be held responsible for the mistakes done by you. Download and Copy the GApps and Moto MAXX, Turbo and Droid Turbo CM14/14.1 ROM ZIP to your phone. First flash the Moto MAXX, Turbo and Droid Turbo CM14/14.1 ROM ZIP from device. Then flash the GApps zip from your device memory. Reboot and Enjoy the Nougat 7.1 ROM CyanogenMod 14.1 for Moto MAXX, Turbo and Droid Turbo. Copy the latest Moto MAXX, Turbo and Droid Turbo CM14/14.1 ROM ZIP file to your phone. Stay tuned or Subscribe to the Moto MAXX, Turbo and Droid Turbo (quark, XT1225, XT1250 and XT1254) forum For other Android Nougat ROMs, CyanogenMod 14/14.1 ROMs, other ROMs and all other device specific topics. Nice rom, but GPS dont work. Any way to fix? Thank you. @hebert_leandro CyanogenMod is no longer continued, so you won’t get any further update on this ROM. CyanogenMod is now Lineage OS. You can try this Lineage OS for Moto MAXX and see if everything is OK in this ROM or not! !